November 5, 2015 – Kane Is Able has expanded its fleet with the purchase of 30 new Kenworth T680 trucks. The T680 employs a suite of technologies and design features that create a safer, more efficient and more comfortable driving experience. 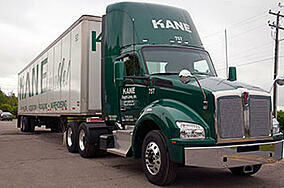 The fleet expansion will support KANE's Northeast trucking and Southeast trucking solutions for transportation management. KANE expects longer service intervals, increased upt ime, lower operating costs, and higher resale value with these new trucks, which feature the fuel-efficient PACCAR MX-13 engine. An advanced truck design reduces in-cab noise levels significantly for a more comfortable driving environment. “We’re making this investment because we know these trucks are more reliable for KANE and our customers, more comfortable for our drivers, cleaner for the environment, and safer for everyone,” said Senior Transportation Director, Lawrence Catanzaro.